Immigration has played a key role in the growth of the US population and economy, but the perennial debate about the positive and negative impacts on native US workers persists. In fact, this debate, both inside and outside of academia, is becoming ever more bitter. There still remains at least one domain, however, where almost-universal agreement appears feasible – immigrant entrepreneurs. If individuals are creating new firms and job opportunities, perhaps employing natives as well, we move closer and closer to a policy ‘slam dunk’. This has been the sentiment behind the efforts of many cities and nations to attract immigrant entrepreneurs, with Steve Bannon’s recent complaints against too many Asian CEOs in Silicon Valley being a rare exception. This sentiment, however, has been hard to characterise with data, which is vital for effective policy design, and to persuade hesitant voters or lawmakers. While researchers agree that immigrants play a crucial role in US firm creation, the ability to say more than this has been frustrated by the difficulty of getting complex data sources on firm ownership, growth dynamics, and immigration status, that are all harmonised in one place. Early research efforts made progress through surveys of Silicon Valley, where the immigrant founder share exceeds 50%, along with the broader tech sector (Saxenian 1999, 2002, Wadhwa et al. 2007). Others have utilised cross-sectional data from the nationally representative Survey of Business Owners (SBO). Fairlie (2012) notes that immigrants form firms at more than twice the rate of natives, and that immigrant-owned firms are more likely to hire employees (although native-owned firms tend to hire more employees than immigrant-owned firms). In an earlier study (Kerr and Kerr 2017), we utilised matched employer-employee panel data to examine the survival and growth of immigrant-founded businesses over time, but faced difficult challenges in inferring the owners of the firms. Our new study, quantifies and characterises the jobs created by immigrant-owned firms using a novel data platform – the Census Bureau’s internal SBO for 2007 and 2012, combined with the Longitudinal Business Database for 2007–2011 (Kerr and Kerr 2018). This platform allows us to evaluate the share and the number of jobs created by firms, as well as the quality of jobs generated. We can also study differences between immigrant- and native-founded firms over time in terms of survival and employment growth. We further cross-verify many of our results with the American Community Survey for 2001–2015. Rather than dwell on the nitty gritty of data development, we here present eight important facts that emerge about immigrant business ownership and entrepreneurship in America. You probably guessed this, but the gaps are quite staggering. 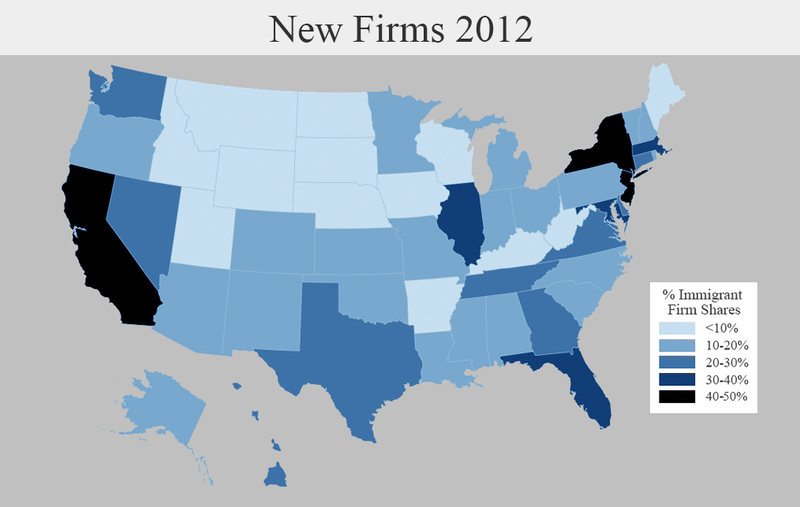 The least dependent states, such as Montana, the Dakotas, and Idaho, had 6% or less of their new firms founded by immigrants in 2012, whereas the shares for California, New Jersey, and New York exceed 40%. These differences are larger than what would be expected based upon immigration population shares, and can be correlated with how immigrant-friendly the policy environments are at the state level. On average, they tend to have fewer employees and lower sales receipts than native-owned firms, but comparable receipts per employee. Immigrant-owned firms have somewhat lower wages (measured as payroll divided by employment), with a 13% differential evident in 2012. This is again evidence of a gap in job quality to native-founded firms. Our paper reports extensive regression analyses that confirm this gap is real, and not due to industry or location differences. The gap shrinks, but only slightly, in the presence of a very stringent set of controls about the founders, business size, and so on. More work is needed to interpret this and the previous finding – a permanent gap would be worrisome and require explanation as to how it persists. On the other hand, if the immigrant-founded businesses provide opportunities for work where none would otherwise have existed, and better labour market opportunities ultimately emerge for employees, then a more positive story emerges. This sectoral concentration has important business and economic implications, traced out by Kerr and Mandorff (2015), and native-owned firms show lower levels of industrial concentration. Immigrant owners tend to be younger and are more likely to combine owners of several ages, perhaps indicative of a greater prevalence for family businesses. Education levels are broadly comparable between immigrant and native business owners. On many dimensions where the differences between immigrant- and native-owned firms are most visible (e.g. offering health insurance, exporting), businesses owned by second-generation immigrants sit in between the other two firm types, showing a fascinating form of assimilation among business characteristics. Both fully and partially female-owned firms are most common in the group of second-generation immigrant-owned companies. This final, bonus fact is pulled from the American Community Survey, which also shows the biggest origin countries to be Mexico, India, China, and Korea. As a region, Central and South America also provide large numbers. The immigrant share appears to be growing faster since 2008 among those less than college-educated, compared to more educated, but science, technology, engineering, and mathematics (i.e. STEM fields) remain substantial for immigrant entrepreneurship. Kerr (2018) describes the collective impact these migrant groups have had on US economic geography. Fairlie, R W (2012), Immigrant entrepreneurs and small business owners, and their access to financial capital, US Small Business Administration Report, Washington DC. Fairlie, R W, J Zissimopoulos and H A Krashinsky (2010), “The international Asian business success story: A comparison of Chinese, Indian, and other Asian businesses in the United States, Canada, and United Kingdom,” in J Lerner and A Shoar (eds), International Differences in Entrepreneurship, University of Chicago Press and NBER: 179–208. Kerr, W R (2018), The Gift of Global Talent: How Migration Shapes Business, Economy & Society, Stanford University Press. Kerr, S P and W R Kerr (2017), “Immigrant entrepreneurship,” in J Haltiwanger, E Hurst, J Miranda and A Schoar (eds), Measuring Entrepreneurial Businesses: Current Knowledge and Challenges, NBER Book Series Studies in Income and Wealth: 187–249. Kerr, S P and W R Kerr (2018), “Immigrant entrepreneurship in America: Evidence from the Survey of Business Owners 2007 & 2012,” Harvard Business School, Working Paper No 18-098. Kerr, W R and M Mandorff (2015), “Social networks, ethnicity, and entrepreneurship,” NBER, Working Paper 21597. Saxenian, A (1999), Silicon Valley’s New Immigrant Entrepreneurs, Public Policy Institute of California, San Francisco, CA. Saxenian, A (2002), “Silicon Valley’s new immigrant high-growth entrepreneurs,” Economic Development Quarterly16: 20–31. Wadhwa, V, A Saxenian, B Risssing, and G Gereffi (2007), “America’s new immigrant entrepreneurs,” Duke University Report.